GCC is witnessing huge investments in oil & gas sector in order to meet the growing domestic demand for energy. Several pipeline construction projects have been awarded recently for supplying feedstock to the refinery and petrochemical industry. With the expansion of pipeline network in GCC, need for reliable and cost effective leak detection system have also increased. Oil & gas pipeline leak detection system market to witness growth in GCC on account of increasing awareness for pipeline safety and environmental concern and it also helps to reduce the cleanup expenses of operators. According to 6Wresearch, GCC Oil & Gas Leak Detection System (LDS) market is projected to grow at a CAGR of 6.52% during 2016-22. Saudi Arabia and UAE are the key revenue generating countries in entire GCC region. In GCC, acoustic / negative pressure wave leak detection system accounted for major revenue share in the overall market in 2015, with Saudi Arabia being the largest contributor. Acoustic / negative pressure wave leak detection system is expected to maintain its dominance throughout the forecast period. Amongst all applications, onshore pipeline segment captured key share in the overall GCC Oil & Gas Leak Detection market due to existence of large pipeline network on land. The report thoroughly covers the GCC Oil & Gas Pipeline Leak Detection System market by technology, application and country. The report provides the unbiased and detailed analysis of the on-going trends, opportunities / high growth areas, market drivers which would help the stakeholders to device and align their market strategies according to the current and future market dynamics. • Historical Data of GCC Leak Detection System Market Revenues for the Period 2010-2015. • Market Size & Forecast of GCC Leak Detection System Market Revenues until 2022. • Historical Data of GCC Leak Detection System Market Revenues by Technology for the Period 2010-2015. • Market Size & Forecast of GCC Leak Detection System Market Revenues by Technology until 2022. 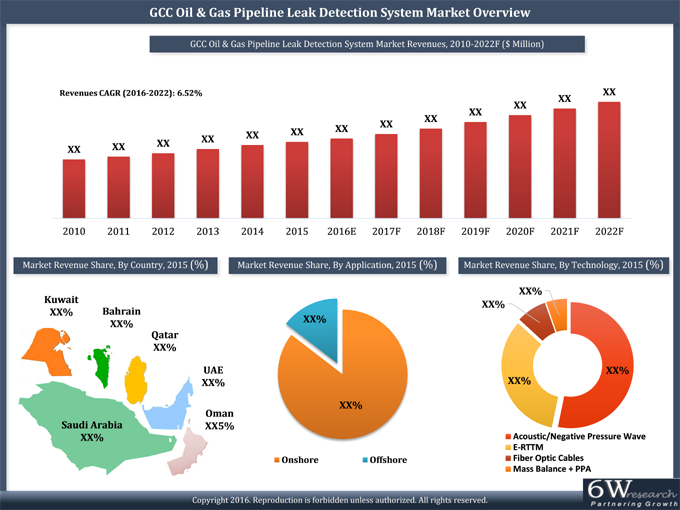 • Historical Data of GCC Leak Detection System Market Revenue by Country for the Period 2010-2015. • Market Size & Forecast of GCC Leak Detection System Market Revenue by Country until 2022. • Historical Data of GCC Leak Detection System Market Revenue by Technology by Country for the Period 2010-2015. • Market Size & Forecast of GCC Leak Detection System Market Revenue by Technology by Country until 2022. • Historical Data of GCC Leak Detection System Market Revenue by Country by Technology for the Period 2010-2015. • Market Size & Forecast of GCC Leak Detection System Market Revenue by Country by Technology until 2022. Pipeline Leak Detection System (LDS) plays an important role in safe pipeline operation. Gulf Cooperation Council (GCC) countries offers huge potential for leak detection system market considering the investments that are being made in oil & gas sector and numerous pipeline construction projects have been awarded over the past two years. Acoustic / negative pressure wave is the largest revenue generating leak detection method in overall GCC in 2015, with Saudi Arabia accounting for maximum revenue share. However, fiber optic leak detection system is projected to register highest growth rate with the introduction of new long distance pipeline projects in GCC. The major companies in GCC leak detection system market include- Atmos, Krohne, Pipeline Technologies & Services (PipeTech), PSI AG, OptaSense and others.